Celtx is quite unique in its kind. It helps to make writing and pre-production somewhat easier. It offers several features that are detailed below. Screenwriting: Celtx is providing users an industry standard screenwriting editor available for screenplays, AV scripts and more. 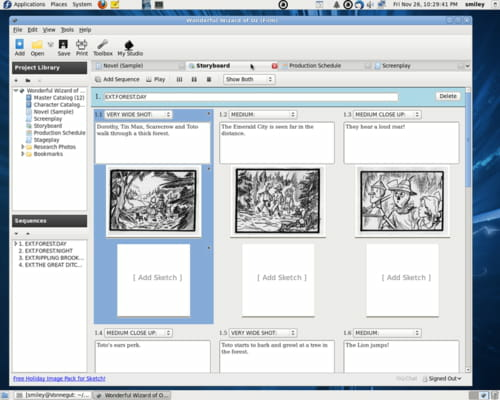 It is also a rich text editor for outlines, templates and printing options. Pre-visualization tool: apart from that, Celtx also features tools to visualize scripts such as storyboarding and sketch tool (pre-loaded icons for cameras, lights and people to be tagged with text as well as other tools for drawing lines, shapes, arrows and text. Sharing: all information about the writer of the project can be shared with the built-in server program. Employees can also edit and publish their work online. Other options: with Celtx, thanks to an option called Celtx Studios, it is possible to manage, store, publish and schedule any project. It is built on open and non-proprietary standards (HTML, XML and RDF). Celtx is a client server application. Latest update on November 20, 2016 at 04:07 PM.